Reserve Bank of India (RBI) has announced its fifth Bi-Monthly Monetary Policy Rates for 2018-19 in Mumbai today. 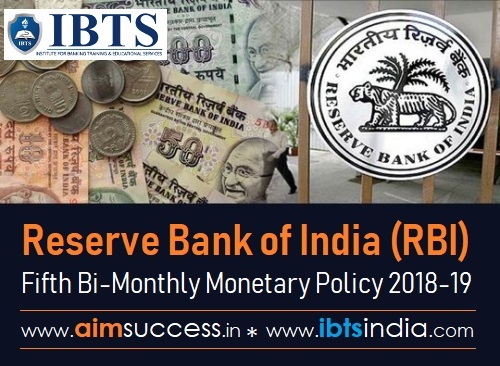 The fifth Bi-monthly policy has been released based on the assessment of the Monetary Policy Committee of the Reserve Bank of India (RBI). Monetary Policy Rates are crucial for the exam, especially Banking awareness. RBI maintained calibrated tightening stance and projected HIFY20 GDP growth at 7.5 per cent. The decision of the MPC is consistent with the stance of calibrated tightening of monetary policy in consonance. The objective of achieving the medium-term target for consumer price index (CPI) inflation of 4 percent within a band of +/- 2 per cent, while supporting growth.